Free Macarons for Jour du Macaron! If there’s one special treat that I love (even more than my beloved cupcakes) it’s Macarons. Macaroons are those coconuty treats, Macarons are parisian delicacy made of two round meringue based cookie shells, held together by a soft filling, such as buttercream or ganache. Very fine almond powder, egg whites and sugar are combined with mastery, to create an initial crisp and airy experience, leading into the macaron’s filling – featuring whatever humble or exotic flavour can be imagined by the inspired pastry chef. And trust me when I tell you, you`ve got to try the many striking flavors even if they sound a bit peculiar together — they are usually heavenly. I was introduced to macarons years back when a friend came back from Paris and brought me back some of these ambrosial delights. Love at first bite. When my husband and I took off to Paris last year for a romantic rendezvous for our anniversary, I was on the hunt for he best of the best in macarons. Of course that led me to Laduree and Pierre Hermé. Today in Toronto is Jour Du Macaron or Macaron Day Toronto. Today participating (and well respected) patisseries across Toronto will come together to offer complimentary macarons to customers. To receive your macaron, visit a participating patisserie and simply mention you are celebrating Macaron Day TO. Participating locations will provide one macaron per customer at no cost, with quantities limited by location. What a fabulous cause to go with a fabulous treat! Since I`m all the way in the the suburbs of the Greater Toronto area, I`m lucky to have my dear husband work right in the heart of Toronto`s Financial District where he is surrounded by many of these wonderful patisseries. Of course he took advantage of Jour Du Macaron and picked up some delicious macarons to bring home to me from one of my favourite patisseries, Petite Thuet. Feels good knowing I`m getting my macaron fix but at the same time, donating to a great cause. 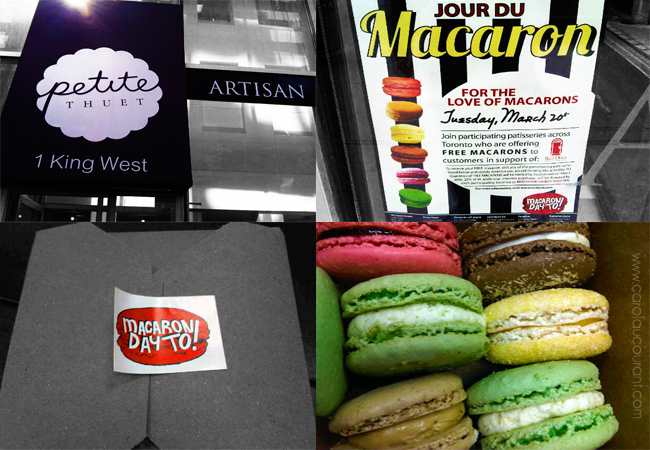 If you’re in the Toronto area – have you taken advantage of Jour Du Macaron today? Head over to participating locations and get a free macaron and discount on additional macarons in support of Red Door Shelter before they’re all gone! And believe me, they’re going quickly!